Sadiq Khan has given his support to the Garden Bridge so long as it is more accessible to “all Londoners”. 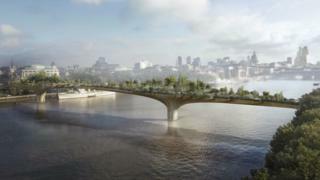 The newly-elected London mayor said the schemed 175 m footbridge connecting Temple with the Southbank “must be a genuinely public and open space”. Mr Khan, who has previously questioned the project’s transparency, insisted on amendments in return for his support. The Department for Transport and Transport for London have each expended 30 million in the project. Mr Khan, said: “The early days of this project clearly fell short of our expectations on transparency. Questions were raised in March when it was exposed Transport for London officials met the designer of the schemed bridge four timesbefore the procurement process began. Caroline Pidgeon, Liberal Democrat London Assembly Member, said Mr Khan’s decision was “highly disappointing” and he should be seeking to recoup all Transport for London funding allocated to the project. Caroline Russell, Green Party London Assembly Member, has also expressed her disappointment in the move. “The Garden Bridge should be scrapped and the Mayor should focus on delivering bridges in East London where people need roads for walking and cycling across the river, ” she said.